Rovio is about to reward Angry Birds fans for watching this Sunday's more traditional contest between Green Bay and Pittsburgh. As we have reported, a new Angry Birds game called "Rio" is expected to launch in April and a full-length animated feature film with the same name is being developed by Rovio and 20th Century Pig Fox. This Sunday's ads for the animated movie will contain a secret code that will allow you to enter a new, special level. So even if you have no interest in football, if you love the Angry Birds, you will have a reason to sit through the game and all of the hoopla that surrounds it. So, to recap what you Angry Birds fans can look forward to, there is the Valentine's Day version of the game that we told you about and that should be released on February 14th for obvious reasons. In April, the whole new Angry Birds "Rio" game will be launched with the animated movie heading to a theater near you sometime afterward. 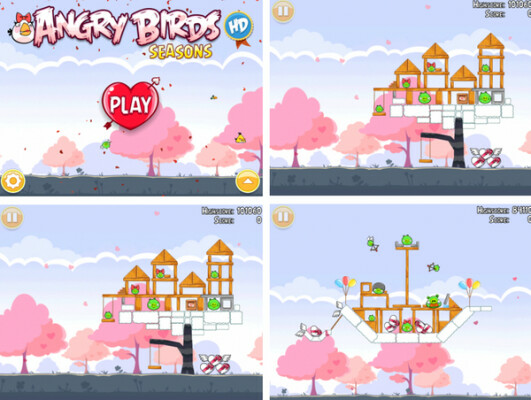 Can your heart handle the Angry Birds Valentine's Day version set to launch February 14th? Big Deal. My flipping bird would get bored playing this app and its brain tiny. wow, l, this is kinda a big deal due to the fact that this is easily one of the most downloaded apps. and your grammer is terrible, if your gonna troll an american website, use atleast american bad grammer. Totally, dude. Like spelling "grammer" instead of "grammar" and "your" instead of "you're". Your way is much better. in russia you angry at bird! No, it'd be in russia bird is angry at you!! !